I adore sea scallops and order them frequently when dining out. I must have assumed it was an art form to get them cooked perfectly, because I’ve never wanted to try making them at home. But a seven-year-old asking for more seafood will make you do crazy things, so I asked my daughter Samantha if she wanted to try scallops. As it turns out, they are easier to cook than I thought. Initially I couldn’t find a recipe for basic seared scallops (other than just cooking them in a little butter, of course), when low and behold I picked up the package of Archer Farms Sea Scallops at Target and saw the perfect Samantha-friendly recipe on the back of the bag. She loved them. I cut the amount of butter, salt, and sugar in half, so here is my version. Drain scallops and dry on paper towels (they need to be dry to get a good sear). Mix salt and sugar in a small bowl, then sprinkle half of mixture over scallops. Melt 1 tbsp butter over medium high heat in a large skillet (I used a cast-iron pan). 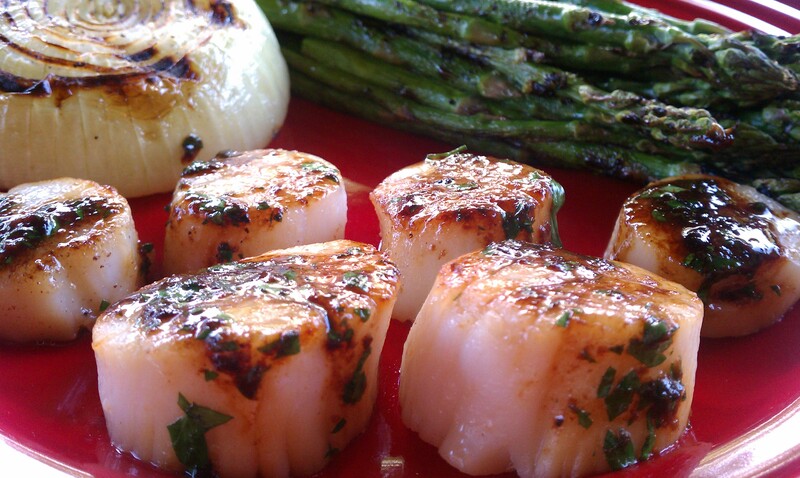 Place scallops in skillet, seasoned side down, and cook 3 minutes. Flip scallops and sprinkle with remaining salt/sugar mixture, cooking another 3 minutes, until browned on both sides. Remove scallops to a plate and keep warm. Add wine to the hot pan and scrape up browned bits to create a syrup. Turn off the heat and add remaining butter and parsley, then pour over scallops.